Assam (Asom, Axom) is a beautiful and diverse state with an incredible range of cultures and landscapes located in the northeast of India. Assam has drawn people from diverse cultures and races in different points of time. 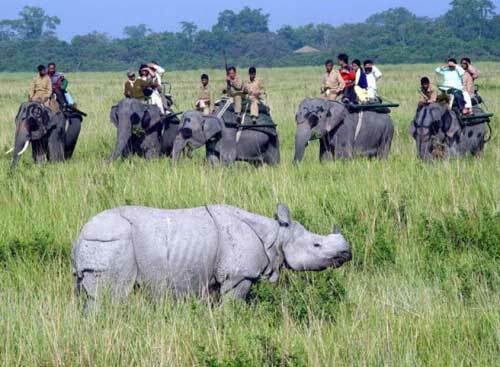 The main tourist attraction is the Kaziranga National Park, home of India's rare one-horned rhinoceros. The city of Guwahati is another place in the state which has in its vicinity numerous ancient Hindu temples and is reputed as an ideal place to explore the whole northeastern region. The capital Dispur is very near Guwahati. 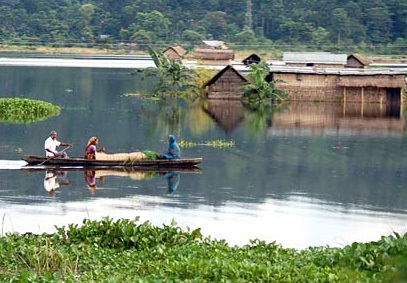 Tezpur is one of the getaway town to Arunachal Pradesh & widely reach by people for Angling & Eco tourism in Bhalukpong. Day 01 : Guwahti Welcome on arrival at Guwahati Airport / Railway station. Transfer to Hotel. After refreshment proceed for Bhramaputra Cruising during the sunset. Optional: One can also visit to Guwahti Zoo which is one of the best & largest natural Zoo of India. Overnight at Hotel. Day 02 : Guwahti - Tezpur (190 kms) After breakfast proceed to Tezpur:Situated on the north bank of the Brahmaputra, Tezpur is a beautiful and multifaceted city steeped in mythology and history.The city abounds in archaeological sites, hills, lakes and gardens. The doorframe of Da – Parbatia is the finest and oldest specimen of sculptural art in Assam and its carving is characteristic of the style of the Gupta school of Art. It dates back to 600 A.D. The sculptural remains of Bamuni hills date back to 9th Century A.D. A cross- shaped bracket lintel ornamented with horned Kirtimukha panels contains the figures of 10 incarnations of Vishnu. The Bhomoraguri stone inscription of the Ahom general Kalia Bhomara Barphukan and Harjjar Varman’s 9 line inscription are located near Tezpur . The picturesque stone inscription of yore is endowed with hillocks, gardens and lakes. The Chitralekha Udyan, the most beautiful garden of Tezpur has impressive ornamental stone pillars, sculptural relics, water sports facility, lush green walkways and a small amphitheatre too. Here, the ancient and the modern co-exist in harmony. Agnigarh hill is the site of the legendary romance of Princess Usha , the daughter of King Bana and Aniruddha , the grandson of Krishna . King Bana kept Usha on this hillock surrounded by fire. A landscape garden with exquisite sculptures, soft illumination and a cascanding waterfall welcome thousands of tourists to this memorial of eternal romance. The hill top provides a spectacular view of the Brahmaputra and the Kalia Bhomora bridge. Day 03 : Tezpur (Excursion to Bhalukpong & Tipi Sanctuary) After breakfast morning proceed to Bhalukpung. Bhalukpung & Tippi sightseeing. Visit the Tippi Orchid Centre. Tippi this is a town which is covered in fog most of the year. It lies at a distance of 4 kms from Bhalukpong. The main attractions here are the Waterfalls, Tipi Orchidarium Arunachal Pradesh has the largest range of orchids in India orchid. Tipi Orhcidarium has more than 500 varieties of orchids growing. The place is also a favourite rafting spot in river Kameng . Overnight at Hotel. Day 04 : Tezpur - Kaziranga National Park (80 kms) Morning after breakfast proceed to Kaziranga National Park: The home of one horned Rhino & many other species of Birds & Animals. The Park is the abode to more than 70% of One Horned Rhinoceros in the world. Highest density of tigers' prey including the large prey biomass of tiger found in the country. Harbours more than 60% of India's wild buffalo population along with the only population of the Eastern Swamp deer and seven species of turtles and tortoises. The other important wildlife found are - Leopard, Fishing Cat, other Lesser cats, Large Indian Civet, Small Indian Civet, Sambar, Barking deer, Hog deer, Gaur, Hog Badger, Hoolock Gibbon, Capped Langur, Assamese Macaque, Rhesus Macaque, Sloth Bear, Gangetic Dolphin and Otter etc. On arrival Hotel check in. Afternoon after lunch proceed for Jungle Safari by Jeep. Resturn to the hotel/resort evening snacks with tea/coffee. Dinner & Overnight at Hotel. Day 05 : Kaziranga National Park Morning explore Panbari woodlands on foot followed by morning and afternoon game drives. Overnight at Hotel/Resort. Day 06 : Kaziranga-Guwahti (230 kms) After breakfast drive to Guwahti. On arrival hotel check in. Rest of the day for leisure/Shopping activities. Day 07 : Guwahti (Dep) Morning visit to Kamakhya Devi Temple: The Kamakhya Temple is a shakti temple situated on the Nilachal Hill in western part of Guwahati city in Assam, India. It is the main temple in a complex of individual temples dedicated to different forms of the mother goddess as the Dasa Mahavidya, including Bhuvaneshvari, Bagalamukhi, Chinnamasta, Tripura Sundari and Tara. It is an important pilgrimage destination for general Hindu and Tantric worshipers. Later transfer to Airport/Railway station to board the train to your home destination.